For first time since liberation of Old City, mass Christian prayer at southern wall of Temple Mount planned for Hoshana Rabbah. The Chief Rabbinate of Israel, together with rabbis of the Derech Emuna organization rabbis of Jerusalem's Old City, have launched a campaign against a new mass Christian prayer initiative at the southern wall of the Temple Mount. For the first time since the liberation of the Old City in the 1967 Six Day War, the Christian groups are reportedly poised to hold a prayer service for the "return of Jesus" on the morning of Hoshana Raba, the last day of the Sukkot holiday, which falls on October 15 this year. The prayer service, which is to be open to all, will be held at the feet of the Hulda Gate on the southern wall of the Temple Mount, the holiest site in Judaism. Derech Emuna rabbis point out that the prayer service is part of a recent troubling trend of expanding control by the Christian Church in the Old City. That expansion has most notably included a secret deal revealed in July in a Knesset Interior Committee, by which Christians received permission to hold fixed Mass prayers in the David's Tomb Compound in a breach of the status quo of the site, and a breach of the law regarding holy sites. 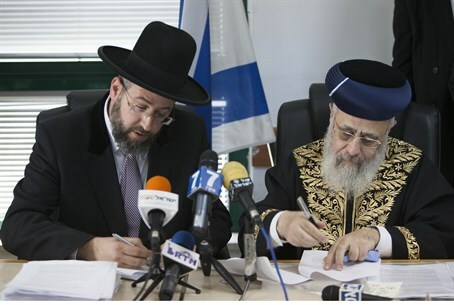 "For those responsible for giving the permit for this: prevent the gathering," the Chief Rabbinate demanded in a statement responding to the prayer service. The Chief Rabbis likewise called on Jews not to join the prayers, saying "to our brothers in the house of Israel, it must be said not to join a prayer meant to prevent the true redemption of Israel." "The goal of the organizers is to get their hands on the (Old) City and the Holy Land, and to disconnect our brothers the house of Israel from the Land of the Living," added the Chief Rabbis in a reference to the Torah. "According to our holy Torah we must distance from this event, and it forbidden under any circumstance to join them."